A stream of people are walking along the side of the road. Men, women, children, old people. A few backpacks, little baggage. Directed to the United States. They have been traveling for 4 days. About 2-3 thousand people. More than 5,000 people left from San Pedro Sula, Honduras. Hundreds more joined from Guatemala and El Salvador. On the border between Honduras and Guatemala they were repressed with tear gas by the Guatemalan police before being able to cross. Mexico has “opened” the doors. The new elected president, Andrés Manuel López Obrador, “AMLO”, will not have wanted to get his hands and face dirty by repeating the violent scenes of the previous caravan, when thousands of people were blocked on the bridge of Tècun Uman, on the river Suchiate, and following clashes with police have thrown themselves into the river to cross. The proposal made to the migrants of this third caravan was to register at customs, and wait for the visa. People who accepted were issued with an identification bracelet and were returned to Guatemala for five days awaiting a promised visa for a year; for now, they are still stuck on the border. Thousands, about 2-3,000 people, have decided to continue their journey by refusing proposal and registration, denouncing the government’s attempt to deceive them by blocking the caravan in Guatemala, waiting for promises never fulfilled in the past. They pressed for the border to be opened and crossed the border between the 17th night and the 18th morning, walking again. Direction: Tapachula, forced stage before continuing the journey to the north. 37 km on foot. They arrived in the evening of the 18th, occupying the main square of Tapachula to sleep. It is the first time that the caravan is not helped by anyone. Unlike other caravans, and despite the humanitarian rhetoric of AMLO, no organization, church or local authority supported the migrants’ journey. No medical care or food distribution was organised. A large chunk of the caravan left this morning. At 4 a.m., they returned to the road and began the journey northwards. They arrived in Huixtla in the evening, where they camped. They walked 40 km. 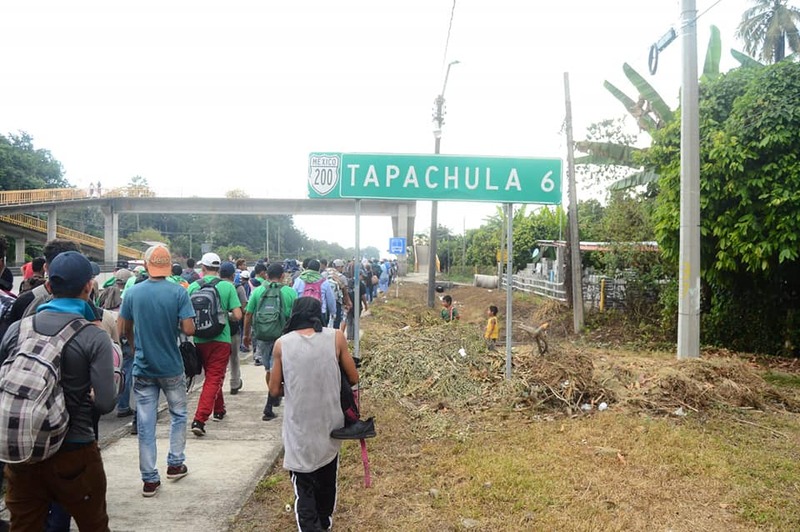 Another part of the caravan remained in Tapachula. They wait. They are waiting for the more than 3000 people who are still stuck in Guatemala. They are waiting for the more than a thousand people who are leaving with a new caravan from Honduras. They are waiting for a new caravan that seems to be leaving from Guatemala. “We must remain united, and be many, together. If not, the police and the narcos will have an easier time dividing, isolating. Check. Maybe deport, or kidnap. The border, when you don’t have the documents, is everywhere. It’s the bus you get on, the road you take. The places you can or can’t go to. It’s the police. A thousand people continue to occupy Tapachula Square. They keep waiting. They have improvised a cooking camp, but there are lots of people, little food. Many families and children. Meanwhile, the number of people at the Mexican border increases. It seems that they are between 5 and 8 thousand. Some people cross the river on foot and arrive in Tapachula. Thousands remain stuck in Guatemala. Tomorrow the 5 waiting days that the Mexican government declared necessary for the issuance of the one-year visa expire. We will see tomorrow whether they will keep their word. This will result in the action of migrants who trusted them and registered. Meanwhile, the first piece of the caravan – about 1000-1500 people – is already further north, in Oaxaca. The power of the masses. Organizing together, for a better life. To cross the border. Not to despair while waiting for documents. Before, there was a train between Guatemala and Mexico. The Beast. A good way to get through. It was abolished a few years ago. Since then people have been passing in different ways, there are many informal paths. But not everyone succeeds. The caravan is an innovative method. Start together, en masse. It’s like a migrating population. A population that flees poverty, violence. 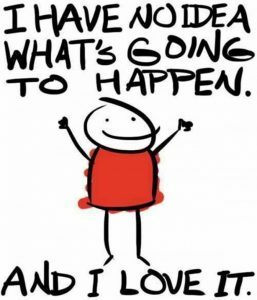 Looking for something better. The speeches against Juan Orlando Alvarado, the Honduran president, and against his policy of exploitation and oppression are endless. “There’s no future in Honduras,” many say, from the 15-year-old boy who travels alone, to the family with children in their arms. The border is just a line to cross, for now. But individually it is more difficult. There are many controls, not only at “legal” crossings, but on the way to the north, where military and police check buses, cars, combie, looking for irregular migrants. The caravan is made for this. It’s also a protest, if you like. Against the government of Honduras and its economic management. Against the borders and their control and selection mechanisms. A struggle, the migratory one, that seems more and more often to pass from the “individual” to the collective. Because united we are stronger. The caravan is self-organized. “Here there are no leaders, no one imposes themselves. We all decide together, we are all leaders”, they say. The choices are made in the assembly. There are no structures behind it. “We united ourselves because we are stronger together. We just want a more dignified life. There is no future in our countries. That’s what we’re looking for with this caravan. “And that the politics of our countries understand it,” they seem to add. People flee because politics and economics abuse their power and take everything away from the people. They are suffering and dying of hunger and violence. Meanwhile, Honduras has increased its controls to limit the flow of people leaving the country. To leave Honduras, the police now require a passport, and if they are minors, the permission of both parents. A rule that goes against those who escape from family violence, since those who do not present these documents risk imprisonment for up to 3 years. If a woman runs away with her children, for example, it is “illegal”. It seems that hundreds of people have been arrested for this at the border of Agua Caliente, between Honduras and Guatemala, many of them were minors. They were brought back by bus to San Pedro Sula, the starting point of the caravan. In addition, controls on buses have been increased to prevent minors from leaving. The Mexican state requires biometric data, fingerprints and photo signage to all those who want to access the country. But amongst this caravan, at least 2000 people did not accept the provisions of the government, were not registered. It is clear that their fight is not over, and that the road to reach the United States is still long. Also because the risk of detentions and deportations is high. Especially if the caravan melts. Hundreds of people from the first two caravans are still stuck at the US border. So far, at least a few hundred people have been forcibly repatriated.